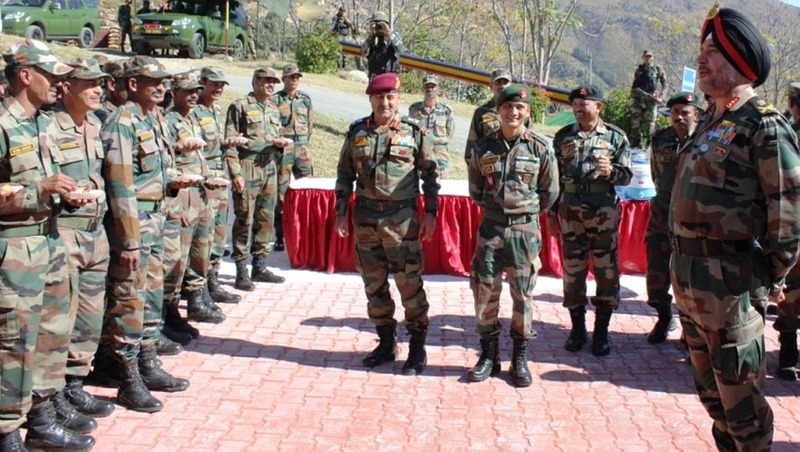 Jammu, Nov 8: Lt Gen Ranbir Singh, Army Commander, Northern Command, accompanied by the White Knight Corps Commander, Lt Gen Paramjit Singh visited hinterland posts of Kishtwar and Suigarh sector to review the operational preparedness and the prevailing security situation. During the visit to the sectors, the Army Commander was briefed by the commanders on ground about the current operational and prevailing hinterland security situation and the preparedness of the formations in dealing with the same. The Army Commander was also updated by the White Knight Corps Commander on current internal security situation in the Kishtwar region and measures undertook by the Army & civil administration for controlling the situation. The Army Commander also interacted with Civil Admin-istration Officials at Kishtwar who briefed on the Internal Security Situa-tion in the region in light of unfortunate incident on 01 Nov 2018 wherein Mr Anil Parihar and Mr Ajeet Parihar were killed in a cowardly act. The Army Comm-ander expressed his condolences to the bereaved families and lauded the role played by the leaders of the region, elders, local populace and joint efforts of all Security Forces that helped in maintaining peace in Kishtwar and adjoining areas. The Army Commander was also briefed on the actions being taken to ensure a robust counter terrorist grid to enable continued peace and stability in the region. The Army Commander also interacted with the soldiers and complimented them for their dedication to duty and high standard of professionalism. The need to be prepared for effectively meeting emerging security challenges was also reinforced by the Army Commander to the troops during his interaction. He exhorted all ranks on the need to remain vigilant to counter the nefarious designs of the inimical and anti- national elements.